You are currently browsing the archives for the T.S.W.T.P.H. category. The Mick Ronson biography ‘The Spider With The Platinum Hair’ will re-launch on April 6th, 2017 via John Blake Books. Now, in its third printing this reissue arrives with a brand new gorgeous cover and a few additional pages. This update picks up where the story left off in 2009 and brings the reader right back to Hull where currently celebrations are in the works to commemorate its favorite musical, native son: RONNO. Shortly after John Blake Books bought out our former publisher, TSWTPH received a big digital nod getting issued as an eBook for the very first time. Clearly, this allows the Ronson story to reach more people worldwide and we couldn’t be happier about that. In the wake of David Bowie’s passing, the revival of vinyl records and the recent activities of his family, peers and hometown, it’s as if there’s a renewed interest in Ronson and frankly, its due time. We are deeply honored that people still care about this little book and we’re more proud of it today than ever. God bless The Spider With The Platinum Hair – we truly hope that you enjoy this new edition. A USA release is scheduled for October 1st 2017! 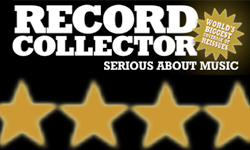 Issue 371 of Record Collector Magazine includes a four star review of Weird And Gilly’s book, The Spider With the Platinum Hair. On Friday December 4th, Weird And Gilly will be hosting a book signing event at Blue Arrow Records in Cleveland, Ohio. There will be records, live music, readings and more. Thanks to our friends at Spontanuity for this footage! 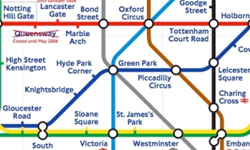 Weird and Gilly’s full report on Mott Week UK 09 – Coming SOON!! Suzi Ronson and daughter Lisa will discuss the upcoming documentary titled …And Ronson Played Guitar. Listen in while they share stories, news of the film, and talk about the worldwide effort to get Mick inducted into the Rock And Roll Hall Of Fame in the ‘sideman’ category. 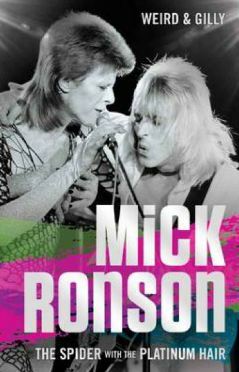 On the 1st of October, Independent Music Press in London will publish the fully updated and revised edition of the Ronson biography, Mick Ronson: The Spider With the Platinum Hair. The film and book release will be the topic of both radio shows when the Ronsons and authors Weird and Gilly team up to talk about Cleveland, glam rock, and the extraordinary career of Mick Ronson. 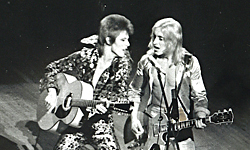 This Week marks the 37th Anniversary of the very first time David Bowie and guitarist Mick Ronson performed in Cleveland, Ohio. The USA tour launched here and the opening gig at Cleveland’s Music Hall was quick to sell out. This legendary concert is considered a landmark show in the history of Ziggy Stardust And The Spiders From Mars. Mick returned to Cleveland many times during his musical career and even received keys to the city in November 1989. After losing his battle with cancer, Mick passed away in 1993 at the young age of 46. The special guest (formerly surprise guest) at MTH/MTK will be none other than JOHN FIDDLER, singer of post-Mott band BRITISH LIONS and leader of the legendary MEDICINE HEAD. Among his greatest fans were two other Johns – Peel and Lennon. Weird And Gilly are excited to relay the announcement of three events planned to coincide with the Mott The Hoople reunion shows in London early next month. Visit http://www.morgan-fisher.com/hoopling.html or click the Boogaloo Dudes image for more information. about a Mott The Hoople and Mick Ronson event in England and you’re all invited! It’s Official! 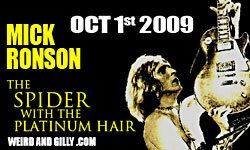 The new edition of Mick Ronson: The Spider With the Platinum Hair is scheduled for release October, 1 2009. Out of print for nearly five years, Mick Ronson: The Spider With The Platinum Hair is a highly anticipated title and only weirdandgilly.com promises autographed copies. Reserve now and you’ll receive an exclusive Mick Ronson guitar pick and a commemorative bookmark (while supplies last) when your book ships. If you’ve already reserved your copy (here, or at wngproductions) be assured that you will be notified about the status of your order. After losing his battle with cancer, Mick passed away in the spring of 1993 at the young age of 46. From his days as a mobile grocer to his performances at Wembley Stadium, this minutely detailed biographical account features exclusive interviews with close family, friends, musical colleagues and admirers as well as scores of unpublished photographs and unseen rarities including: a hand-written six-page autobiography by the man himself, extracts from his personal letters home, love letters to his first girlfriend, family album photographs and an exhaustive illustrated discography. As a result, this book provides a deeply intimate and compelling insight into the life and times of an extraordinarily talented guitarist.